Discussion in 'General Freemasonry Discussion' started by Blake Bowden, Feb 16, 2009. Richmond and Virginia boast that the oldest building for Masonic purposes in the nation is located in the erstwhile capital of the Confederacy. Nearly 150 years ago--1785 to be exact--the Masons had begun the undertaking of a hall for their own use, and it is of record that they encountered many obstacles. This old building was built and used exclusively for Masonic purposes from the date of its occupancy to this good day, with a few exceptions. The building at times was used by the Hustings Court of the City of Richmond when the regular courtroom was used by a higher court. It was also the resort for the ultra-fashionable people of early Richmond to hold parties, balls and various other social meetings in the then spacious structure. With these exceptions there has never been in the ancient building other than Masonic gatherings. It is doubtful if there is another Masonic building in America which has had beneath its roof as many distinguished men. The late King Edward of England, then the Prince of Wale, was among the visitors, as was also General George Washington, General LaFayette and his son, George Washington LaFayette, and several other Frenchmen--all of whom were formally elected to honorary membership in Richmond-Randolph Lodge. Richmond Lodge, No. 10, several years ago disposed of its interest in the property so that now it is the sole property of Richmond-Randolph Lodge. When the building was first constructed it was in the midst of Richmond's leading business houses and on the fringe of the bon ton residential section, for 150 years ago the city had not reached much further than what is now Fifteenth Street for its western boundary. The building itself is unique in that it is a perfect cube and the lot on which it stands is also a perfect cube, which Masons will understand. Today its surroundings are not what they were in the good old days--factories, warehouses, shops, stores and the like. The old members of the lodge, and there are a great number of them still alive, retain their membership there, and while many of them have moved as far west as the Soldiers' Home section they usually make a pilgrimage to their old and first love and attend its meetings, as do their sons and grandsons. When the building was first used it was a one-story affair, according to the best information obtainable. The financing of the lodge was by lottery, and for that reason--when the exechequer ran low and the lottery not having produced the necessary funds for the completion of the structure--work was stopped when the first story was finished, and for some years the Masons used that, but later there was a revival of business and the members once again put their shoulders to the wheel and the present edifice was completed. The first story was of brick, and the super-structure is of wood. "That your petitioners, being Masons, are desirous of forming a new lodge, have desired the concurrence and assistance of the Richmond Lodge, No. 10, to that end, which they have been so obliging to grant, beg that they be graciously pleased to congregate them by charter into a regular lodge of Free and Accepted Masons agreeable to the constitution of the Grand Lodge, by the title of the Richmond-Randolph Lodge, and your petitioners as in duty bound must ever pray. Thus history shows that this was the first charter granted by the Grand Lodge in Virginia, the Grand Lodge having been formed at Williamsburg in May, 1777. The first session of the Grand Lodge held in Richmond was November 14, 1784, "in the lodge room in the City of Richmond," and Edmund Randolph appeared as the representative of N. 13, which was the original number of Richmond-Randolph Lodge. Location of the meeting place at that time is somewhat conjectural, but belief is that it was in McGuire's schoolhouse, the site which was next door to the present Masonic Hall. Desiring more commodious quarters, the craft opened negotiations with Gabriel Galt, August 12, 1785 for the purchase of a lot of ground "fronting 80 feet on the back street, opposite Mrs. Warrick's," and he agreed to give title in fee simple to said ground whenever asked to do so, the purchasers, George Anderson and other members of the committee representing the lodge. Three years later Galt died without making a deed to the property, but the county court of Henrico in 1792 entered a decree directing the heirs and assigns of said Galt to make a complete and perfect deed to the property, but that deed has never been found. After the lapse of so long a time it is considered that the title is valid. The corner stone of the present building was laid Saturday afternoon, October 28, 1785, by Most Worshipful James Mercer, grand master, assisted by Right Worshipful Edmund Randolph, deputy grand master pro tem; Thomas Matthews, senior grand warden pro tem and Benjamin Day, junior warden pro tem. In those days it was the custom to resort to lotteries for the purpose of raising funds for such undertakings, and so on December 27, 1785, the Legislature of Virginia, in session assembled, passed an act authorizing "the Society of Free Masons of the City of Richmond to raise, under the direction of the common hall of said city a sum of money not exceeding 1,500 pounds, for the purpose of erecting and completing a Free Masons' hall in said city." January 2, 1786, a meeting of the common hall was held when there appeared a committee consisting of "Chief Justice John Marshall, recorder; Gabriel Galt, Foster Webb Jr., David Lamber and John Beckley to form a scheme of lottery agreeable to the above act." That committee lost little time in functioning, reporting January 9, and recommending that James Buchanan, Turner Southall, David Lambert, Edmond Randolph, Gabriel Galt, Robert Mitchell and Foster Webb be named as managers for the conduct of the enterprise, and directed that the prizes should be "paid in hard money, in specie and not in indents." To the faithful performance of such duties bond in the sum of 20,000 pounds was required. 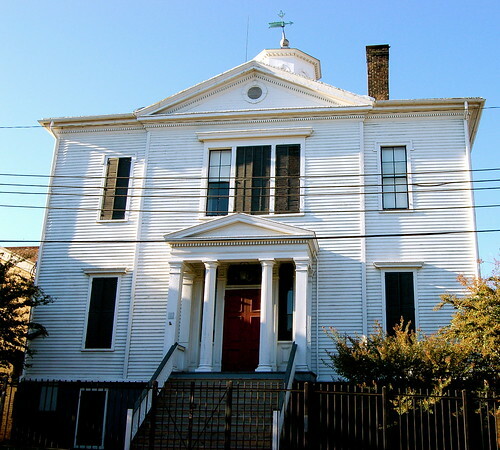 In December 1787 the building as it now stands was finished, the lottery having produced $2,000 for the work, but there was a balance of $1,000 due to William Booker, and he began suit in Henrico County court to recover the same, but James Darmstadt, a member of the craft and a man of means, came to the fore and paid the full claim of Booker. Richmond-Randolph Lodge discharged a duty as requested, laying the corner stone for the old penitentiary building, August 2, 1797. In the ante-room of the lodge there hangs to this day a sabre left by a Federal soldier who was in Richmond soon after the war, when the city was still under military rule, and it is being held by the lodge for the soldier to return and claim the relic of strife. Two ancient brass candlesticks adorn the lodge room, the candlesticks being about two feet in height. There are huge brass keys used in the locks of the building when it was first completed, and in the dining-room are several old pieces of china which are believed to be more than 100 years old and which would make the eyes of lovers of antiques sparkle. Dr. William Moseley Brown, past grand master of Masons in Virginia, in his address to the recent session of the grand lodge, called attention to the old relic, Richmond-Randolph Lodge, urging the need for the proper preservation of the ancient structure and its value to the State of Virginia and to the memebers of the order. The place is visited every year by hundreds of people who have heard of it for the purpose of walking in the structure and viewing the collection of furniture, pictures and manuscripts to be found there and at no other place in America. The old lodge is in good condition, and it is guarded carefully by the members and by the people of of the city, who revere the old landmark and will devote time, money and labor to see that it is preserved for years to come as a place of historical interest and one of the sights of the city to which visitors are welcomed. Awesome! Thanks for sharing that Bro. Blake! I visited Richmond-Randolph lodge when I lived in VA. The lodge is now in a very rough part of downtown Richmond. The tiler was a member of the city police department, for good reason I might add! This may be the oldest Lodge building but I visited a Lodge in Savannah GA a few years ago that appears to be the oldest Lodge. Solomon's Lodge No. 1 Chartered in 1735 this lodge predates the country itself. It's a beautiful lodge and rich with history. That building actually sits on a bridge and a street travels underneath it. You can't tell it from the picture but it is quite interesting. I think they had some issues deeding the property or something or another. I have some other pictures and I was given two 250 year anniversary coins from the bretheren there. One of them was given to Onion Creek lodge. The other I carry with me always.